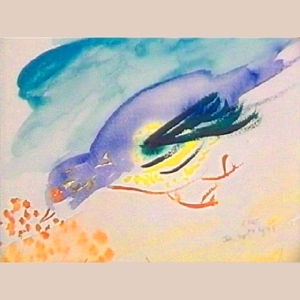 Examining the work of Sri Chinmoy, including his abstract expressionist paintings and bird drawings. Plus, learning what he himself says about art. The question has arisen: How seriously do mainstream art critics take the art of Sri Chinmoy? The words “mainstream” and “seriously” tend to cloud the issue; but the simple answer is that some critics do take Sri Chinmoy’s art very seriously, especially those interested in Asian art and spiritual art, and those who are curators of peace museums. He would not have had numerous gallery exhibitions if there were not some corners of the art world which deeply appreciate his visionary approach. 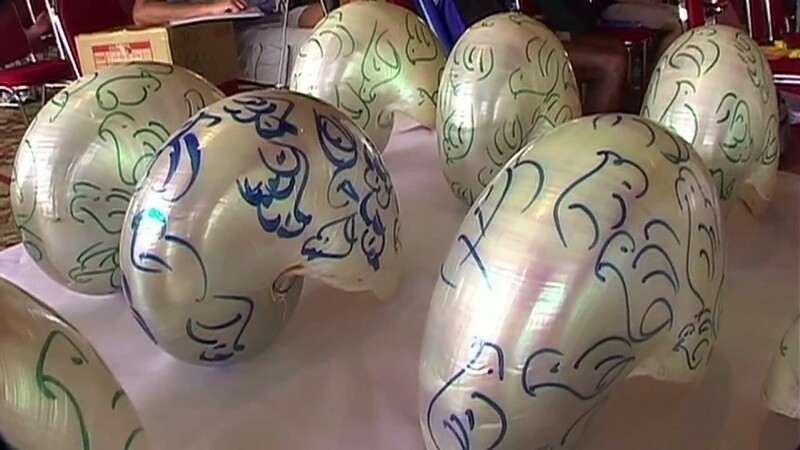 – What is valuable in Sri Chinmoy’s art? – How should we understand it? – What is the connection between spirituality and art? – How does he himself speak about art? Sri Chinmoy is not the product of Western training in art, and is not responding to trends in European art. He’s not answering Picasso or Warhol or Rothko or Rauschenberg, or commenting on the century of death which was the twentieth century, or protesting by going on an art strike. He’s doing something quite different. More than anything else, Sri Chinmoy’s work represents a magnificent outpouring of joy which bypasses the intellectual mind. Yet, we should not mistake his art for the naïve. He had a fantastic capacity to absorb different influences and to make them his own. Some of his major works can be most easily classified as abstract expressionist. 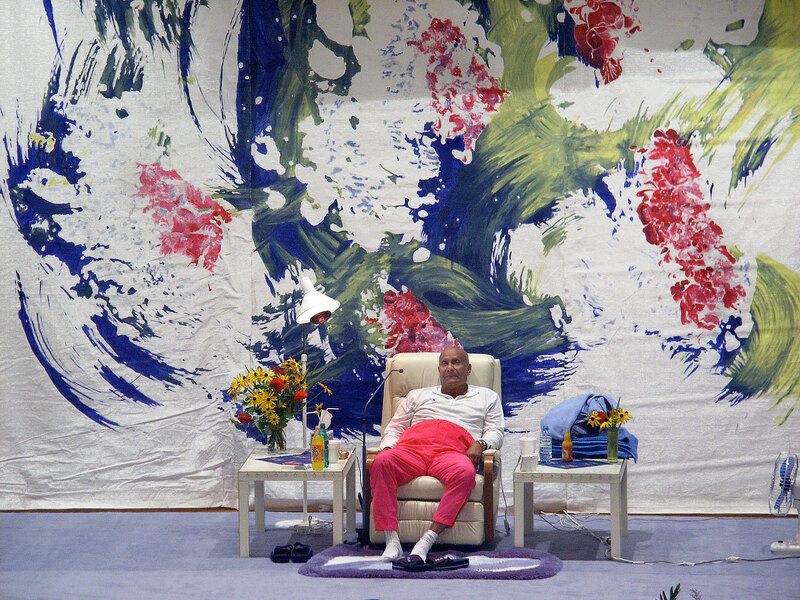 Sri Chinmoy dwarfed by a stage backdrop made from an acrylic painting he did on November 19, 1985. Original 30 x 22 cm. Photo by Apaguha Vesely. There is clearly a worlds within worlds quality as we move through the different sections; and while most of it is abstract, bird forms do emerge amidst a riot of colour and texture which is yet not chaotic, but reflects a balance between freedom and harmony. One thing art critics do appreciate is an enduring vision carried out prolifically over a multi-year period. This is one of the ways Sri Chinmoy distinguished himself. What’s often overlooked is that Sri Chinmoy is (in part) a conceptual artist. 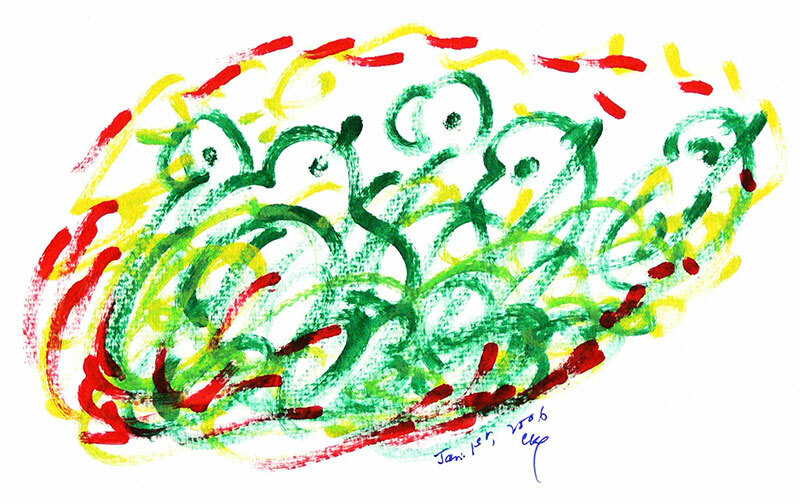 In addition to his abstracts, he drew millions of birds, and was the original put-a-bird-on-it guy, as I discuss in Part 1, which includes videos of large gallery exhibits. Most often exhibited are his paintings and drawings on canvas or paper, but he was also fond of drawing on objects such as those he encountered in his travels. While visiting Bali in 2001, he transformed ordinary objects into objets d’art by adorning them with his characteristic bird forms. There is often a sense of playfulness in Sri Chinmoy’s work, and this playfulness is meant to disarm the viewer. The latter work may make us smile and remind us of the Dada artists. In a world of mass-produced commodities, Sri Chinmoy adds his signature element — his consciousness — to something that was extremely ordinary, thus transforming it. 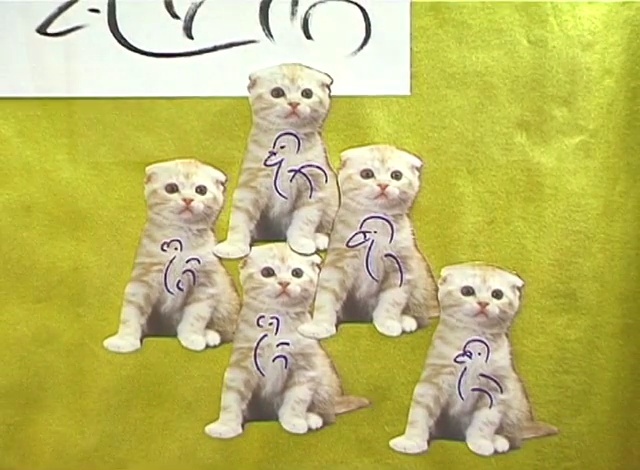 Mass-produced cats vs. hand-drawn birds! There are deep parallels between art and spirituality. The secular non-art space we routinely inhabit and traverse tends to numb us and make us unaware of the artistic and spiritual dimensions of life. The secular media space of news, traffic, weather and sitcoms — as well as the physical space dominated by rectangular office blocks and subways filled with trash — these things constitute a pervasive environment which shapes our perceptions while also numbing us. That’s why environmental psychologists are fanatics for creating parks and odd-shaped spaces which liberate our perceptions and give us back our humanity. It’s no wonder that someone with a new message to communicate may go up on a mountaintop or take followers out into the desert in order to create a liminal space — a place where change becomes possible. Society tolerates all kinds of ideas as long as they don’t lead to real change. But historically, the typical reaction to anything producing real change has been one of hostility. Ideally, a sacred space such as a church or temple should be a place where change is possible; but this is not always the case. In Jesus’s time, the temple had become ossified and was not the best place to present a blueprint for creating a more compassionate society. Art is the new religion of today. When you go [to an avant-garde museum], you don’t understand, but you trust. That’s what the religion is about — you have to trust because it’s in the museum! Our works of art appear to have become ruins. Only our perception is real, and our senses are bombarded with the images and sounds of media which inform us, but do not transform us. In a society saturated with data, the function of the artist is no longer to depict events, but rather to reawaken our perception. This reawakening of perception is a shared concern of both artists and spiritual teachers. When Jesus preached the Sermon on the Mount, people got something from this which they weren’t getting from their temple at the time. The temple had become a commercial space due to the activities of the money-changers. There, it was business as usual. In the physical space of the temple, Jesus did not find the openness or suspension of disbelief which would have allowed him to create a sacred space. Therefore, he spoke upon a hillside. Had there been a museum handy, perhaps he would have chosen that! Like a great music that puts to shame lesser musics, the sacred space is innocent in itself, but reveals by contrast that which is profane or devoid of true meaning. The truths we encounter in the sacred space — whether we call them spiritual truths or artistic truths — may put us in conflict with the conventional and mundane. This is so because the conventional and mundane is not actually a passive or neutral environment, but rather a place where messages are being blared over loudspeakers, only we have grown deaf or numb through constant exposure. Insipid elevator music is propaganda, smoke-filled rooms are propaganda, political speeches which say nothing are propaganda, commercial advertisements are propaganda. Together these things speak of an existence ruled by production, consumption, procreation, entertainment, technological enhancement, and miracle drugs. It makes no sense, yet there is little time to ponder it. The space for artistic and spiritual enlightenment either does not exist, or else has been banished to some remote location we must consciously seek out. I would say the latter is the case. This is the subtext of François Truffaut’s vastly underrated film version of Ray Bradbury’s novel Fahrenheit 451. There, in the mainstream everything has become topsy-turvy: Instead of putting out fires, firemen burn books. The only remaining option for people of refined sensibilities is to seek out an alternative community which still values art, literature, and spiritual insight. There’s a paradox here: On the one hand, we need only look within. On the other hand, it’s difficult to find support for the inner journey while fully ensconced in the noisy hubbub of the mainstream. When the artist does something new and unexpected, this initially creates confusion and conflict; leading to protest and condemnation, but eventually to dialogue. Finally, in the course of trying to understand the artist, we do get an intelligible picture. We gain insights previously lacking because we were stuck in an environment which constantly (but invisibly) reinforced a trite, propagandistic view of reality. But by creating an “anti-environment” (or sacred space), the artist ultimately liberates us. This is similar to the spiritual teacher who challenges our preconceptions and ultimately ushers in a new consciousness. Genosko writes: “The question becomes whether the hateful contraries are in a work or whether a work forms a hateful contrary to [conventional] reality.” This is similar to questions asked by sociologists about new religious movements. Most movements do not intentionally advocate some contrarian ideology for the express purpose of entering into conflict with society. Rather, like the artist, they offer a fresh perspective which is interpreted with hostility by the mainstream because it’s different, not immediately understood, and viewed as threatening. We can consider the Sermon on the Mount in this context. The ideals Jesus commended were not hateful in themselves — far from it! But they threatened what was then (and to some extent, still is) the established order. The order of the day remains self-interest; most individuals and nations continue to pursue it single-mindedly. Still, there has been some progress. Gary Genosko also writes: “Humour and even amateurism become anti-environmental modes for McLuhan in The Medium is the Massage. Humour and amateurism both apparently undercut the ‘official’ and therefore take the present environment, which is invisible, and suddenly make it visible…” We can use this concept to better understand painter Henri Rousseau — and via Rousseau, Sri Chinmoy. Rousseau was neither a member of the official school, nor a true member of the avant-garde. But he was embraced by the avant-garde because his works had a slightly humorous, amateurish quality, yet were filled with freshness and originality. One aspect of the contemporary avant-garde is directness of expression, and a willingness to explore new techniques to achieve it. If one views videos of Sri Chinmoy improvising on piano or pipe organ, one sees that his technique is quite avant-garde, including liberal use of fists and elbows. When one opens one’s ears and one’s heart to his music, one discovers unparalleled directness of expression. The great leap for the listener is to catch a glimpse of what Sri Chinmoy is trying to express. Then one can never doubt his genius. He can never be confined to any of the conventions or avant-garde structures that surround him. So, although he aspired to be an academic painter, he wasn’t an academic painter; although he was in some ways appropriated by the avant-garde, he was never really an avant-garde painter; nor can he be confined by terms like primitive, or naïve, or a Sunday painter. And therefore, he’s never been put to bed. And in a way, each generation, I think, can and has rediscovered Rousseau for themselves. Was Monet a beginner? Was Picasso a beginner when he was about to die? The artist is always rediscovering the child. I don’t mean that he is childish, I mean he finds the child aspect. And we must remember also that Freud said that to be creative is to be prodigious. And that’s one thing that is misunderstood in the art world. Everybody feels that the fewer things you do the better you are. Not from Freud’s standpoint. To be creative means to be prodigious. 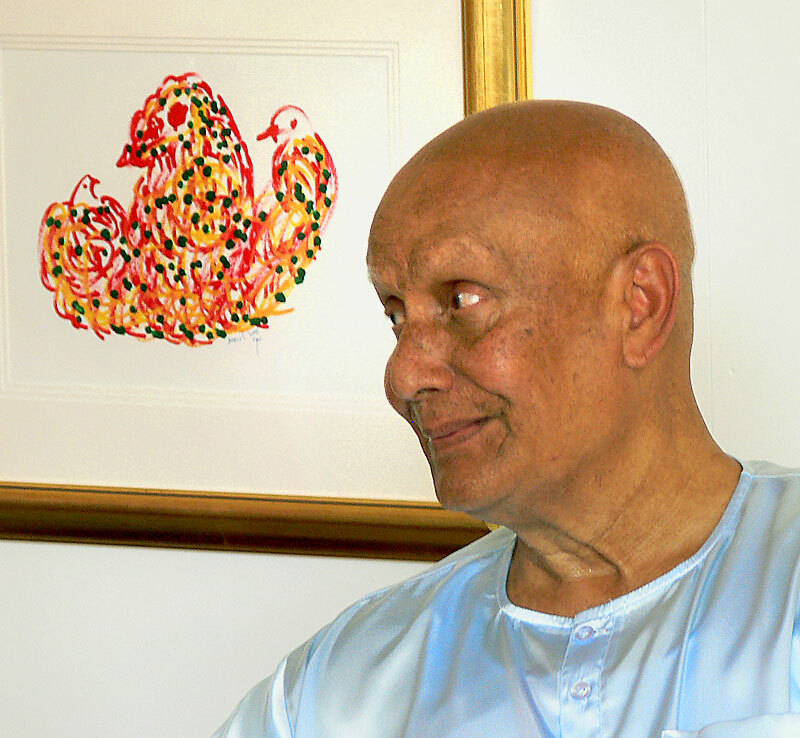 A very happy 85th birthday to Sri Chinmoy, whose legacy continues on after his physical death. Sri Chinmoy sometimes preferred giving concerts, art exhibitions, or live demonstrations of painting to giving talks on spiritual philosophy; and I suspect this is related to the ability of art and music to bypass our ordinary, prosaic thinking and create a sacred space which gives rise to poetical perceptions. The reader may observe that I speak of Sri Chinmoy’s music, art and poetry somewhat interchangeably. I do not do so out of carelessness, but because they are intimately connected. 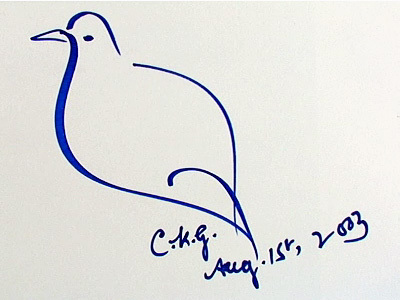 When one enters into Sri Chinmoy’s sacred space, one finds bird forms, bird references, and bird imagery everywhere. He sometimes opened concerts by playing the dove ocarina — a flutelike instrument in the shape of a dove. His was blue ceramic. 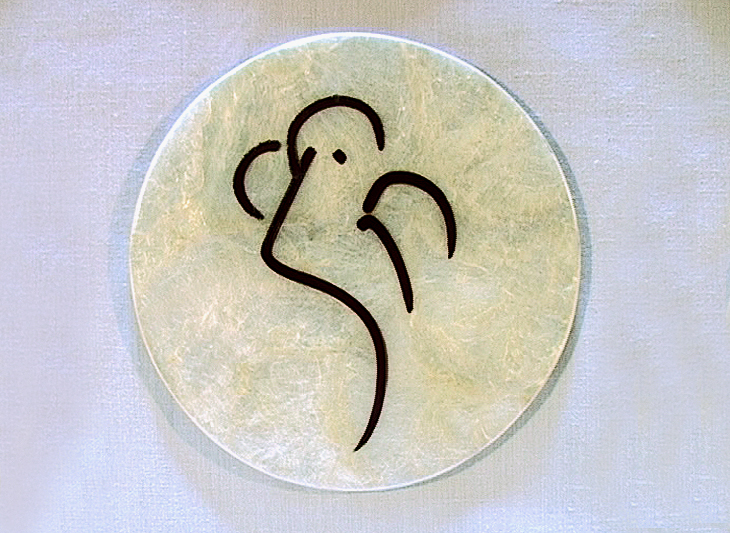 Trilok in Sanskrit means three worlds. In Indian mythology the three worlds are heaven, earth, and the world beneath the ocean. As artists we consider the three worlds to be the world of the performer, the audience, and that abstract space where the performer and the audience meet to achieve a sense of harmony. Here again, the concept of the sacred space — which is not a static space, but an active environment where learning and growing takes place. One imagines that when Plato taught the “Metaphor of the Cave” to students, he did not ask them to copy it by rote, but rather opened up a sacred space in which their minds might grasp the possibility of life beyond the cave. As the world is ravaged by war, peace becomes something we find in the museum. In the age of the electric, outside and inside disappear. The global community of artists and seekers dedicated to peace becomes a museum without walls. We bring Peace Park home with us, cleverly hidden somehwere near our aorta, unattested to by customs declarations. We recreate it where we are. There are many ways of understanding Sri Chinmoy’s art, not least of which is to approach it directly, or to encounter it in its natural habitat — that is to say, the sacred space. 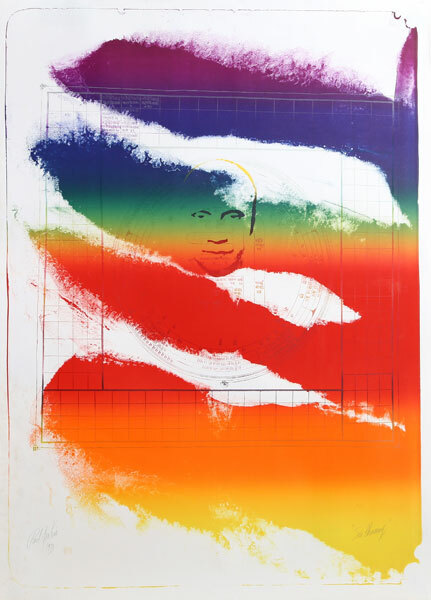 But for those who prefer a more traditional art history approach, once can begin to understand some facets of Sri Chinmoy’s art via Paul Jenkins. Presidential candidate Hillary Clinton recently quoted a Mexican proverb which says: “Tell me with whom you walk, and I will tell you who you are.” Those who walked with Sri Chinmoy were often fellow poets, musicians, and artists who shared an interest in meditation and Eastern philosophy. 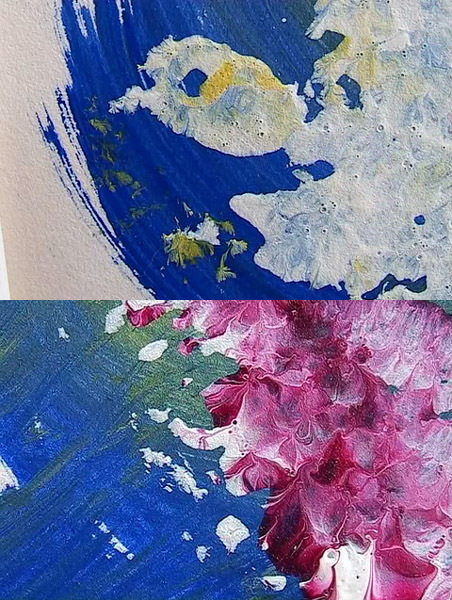 One of these was Paul Jenkins (1923-2012), the American abstract expressionist painter, who studied with Sri Chinmoy in the 1970s, and appears in two short films about Sri Chinmoy from the period. 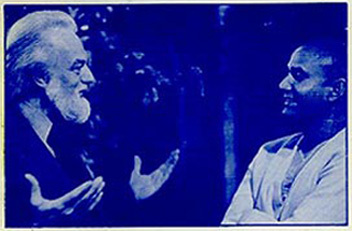 In one, he discusses Sri Chinmoy’s painting; in the other, he talks more about Sri Chinmoy and meditation, as well as demonstrating his own style of painting at the time, which was a type of action painting (or pouring) guided by meditation. One could draw arrows (albeit disjointed arrows) from Jackson Pollock, to Paul Jenkins, to Sri Chinmoy. Yet, Pollock and Chinmoy represent polar opposites whose approach to abstract expressionism differs greatly in both philosophy and practice. Pollock was an innovator, but also a volatile personality who struggled with alcoholism and tragically died in a car accident in 1956 at age 44. There’s a sense in which he broke painting wide open in the late 1940s and early 50s, but his style of “action painting” could be difficult to control, and by its nature did not offer an obvious route to further development. In some ways Pollock’s style was a violent reaction to conformism in the era of the gray flannel suit. Paul Jenkins befriended Pollock and learned from him; but Jenkins was of different temperament. He gradually came to explore the connection between meditation, movement, and painting. He relished freedom and the chance meeting of paints on canvas; but unlike Pollock, Jenkins preferred to paint in smooth, flowing motions, acting from a calm, meditative center and guiding the flow of poured paint with his cherished ivory knife. A really good picture looks as if it’s happened at once. It’s an immediate image. For my own work, when a picture looks labored and overworked, and you can read in it — well, she did this and then she did that, and then she did that — there is something in it that has not got to do with beautiful art to me. And I usually throw these out, though I think very often it takes ten of those over-labored efforts to produce one really beautiful wrist motion that is synchronized with your head and heart, and you have it, and therefore it looks as if it were born in a minute. As a meditation master, Sri Chinmoy is king of the beautiful wrist motion synchronized to head and heart. This shines through in both his abstracts and his more calligraphic bird drawings. The latter were also done with great rapidity, so that what we see especially toward the end of his life are great clouds of birds or bird gestures, drawn with such fluidity and rapidity of motion that they seem ready to fly off the canvas. Returning to the earlier referenced 1985 acrylic, we can say that on a local level Sri Chinmoy uses techniques similar to those of action painters to achieve fortuitous collisions of colour and texture, and to create a sense of driving energy and synthesis. Yet, looking at the painting as a whole, it’s not a collision or explosion, but rather reflects a calm guiding hand. In Sri Chinmoy’s abstract expressionism we find a tremendous outpouring of emotion, but never any violence. He is not obsessed with filling the canvas to maximum density through collision, but with orchestrating local areas of chaos into a symphonic whole. There is movement but also stillness; density but also space. 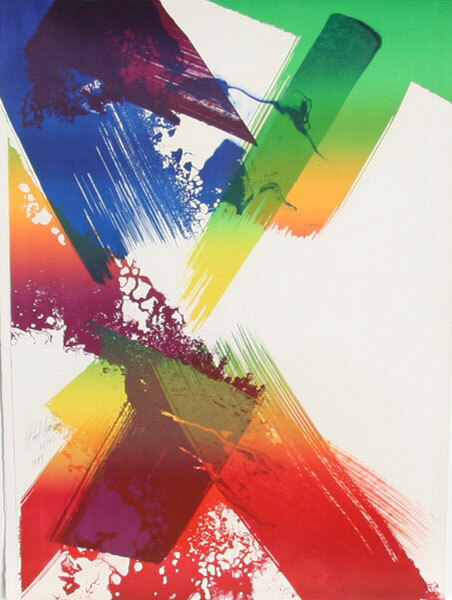 Comparing details of his 1985 acrylic with Paul Jenkins’s Untitled I (1983), we can see similarities in the broad gestural brushstrokes and areas of textured paint. Western civilization has tended to progress through violent trends and counter-trends. The artist is often expected to be a rebel who explicitly sets himself in opposition to society and flouts even its most basic conventions and requirements. Yet, in much of Asia art is understood to be a natural part of life, as is spirituality. The spiritual artist need not act out a stereotypical role as rebel. His goal is not to destroy society, but to gradually transform and enlighten it. In recent centuries, one division in Western thought has been that between the intellectual and the spiritual. The art world is not unaffected by this division. Because Sri Chinmoy is a spiritual artist who values spontaneous expression of the heart, his work may seem less accessible to those critics for whom art is primarily an intellectual pursuit (and a secular one at that). This may contribute to the view that Sri Chinmoy is a non-mainstream artist. As an artist, I do admire very deeply his sense of colour, the rhythm in his strokes, his lovely compositions, the sunny light that emanates from his canvases. 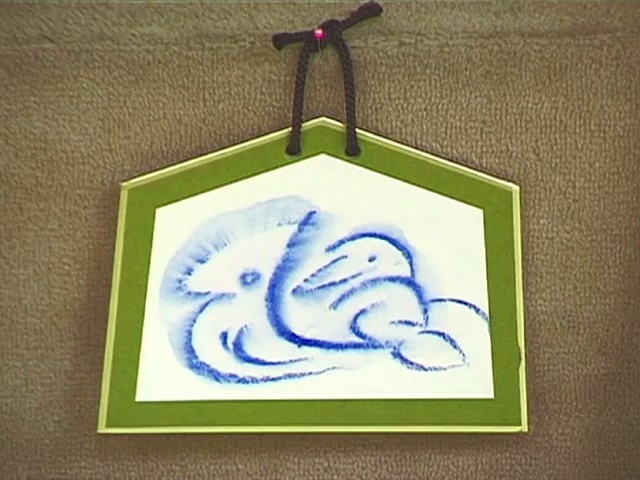 I feel that his art has a tremendous way of inspiring and uplifting the viewer. So from that point of view I do feel that his art is extremely important in this twentieth century. 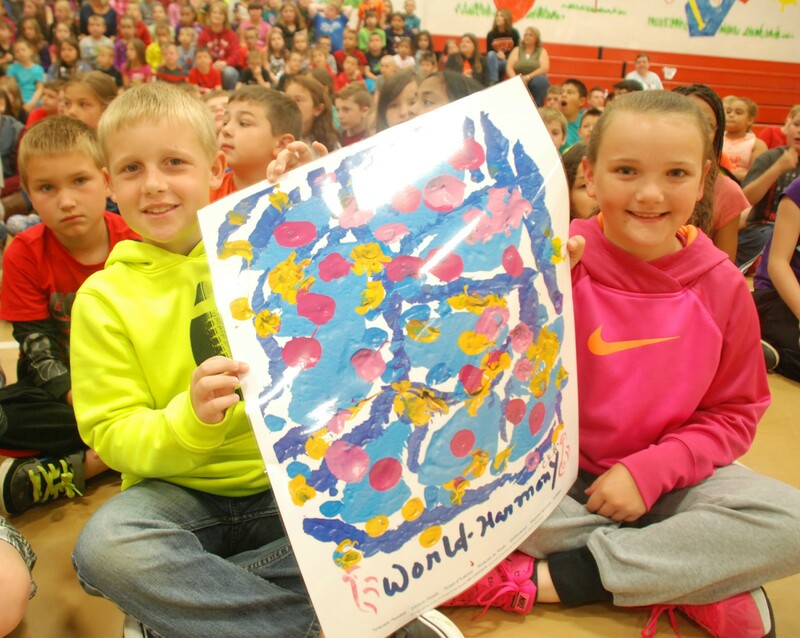 And I think it will leave a very great mark in the world of art for the future. As trends shift over the centuries, I believe Sri Chinmoy’s work will be rediscovered at a time when society has found a more beneficial balance between the secular and the spiritual. Future generations who are more keenly aware of the significance of spiritual art (and the genius of simplicity) will treasure that which some of Sri Chinmoy’s contemporaries have passed over far too quickly. In the meantime, those who appreciate spiritual art today will continue to bask in Sri Chinmoy’s glorious achievements. Special thanks to Kedar Misani, without whose videos and photos of Sri Chinmoy’s artwork this article would not have been possible. Visit Kedar’s YouTube page here. Profuse thanks also to Priyadarshan Bontempi, chief curator of SriChinmoyLibrary.com, which houses an extraordinary collection of Sri Chinmoy’s writings, as well as a growing number of book covers. Visit Sri Chinmoy Library and you’ll always discover something new!